The weather is making me a little nutty. As I write, it’s 62 degrees outside in mid-May: it’s not cold as such — in fact, in the dead of winter I longed for sixty degrees! — but as humid as it is I find myself constantly walking about feeling ever so slightly cold. And over the weekend while I was making this, we even had an overnight frost warning! The outdoor photos you see here look like a warm spring day, but I’ll tell you: I was out there in a pair of thin cotton pajama pants photographing my cold little heart out. Which is all to say that I feel like I need to justify this dish, so classically wintry, by noting the zany ‘spring’ weather. 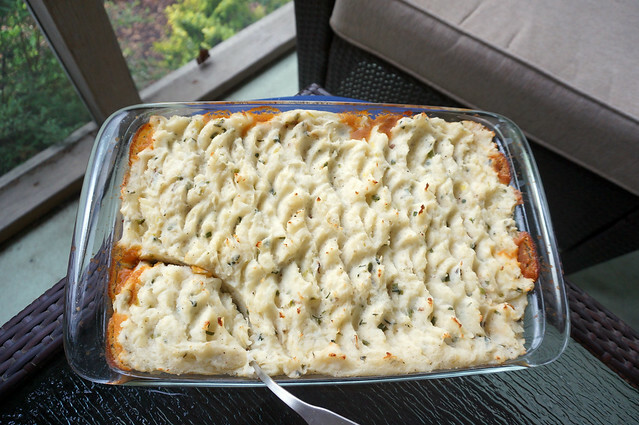 And yet, when I first made this shepherd’s pie a couple of weeks ago, not even thinking of blog work, it was for a large gathering that included a potluck. The dish was born of desperation, of me looking around the kitchen and saying UGH I FORGOT THAT I’M SUPPOSED TO BRING SOMETHING and making it work with the things I had lying around. It was a beautiful, actually-warm spring day, and I expected the piping-hot potatoes and savory filling to be entirely out of place. Joke’s on me: there were four shepherd’s pies there. 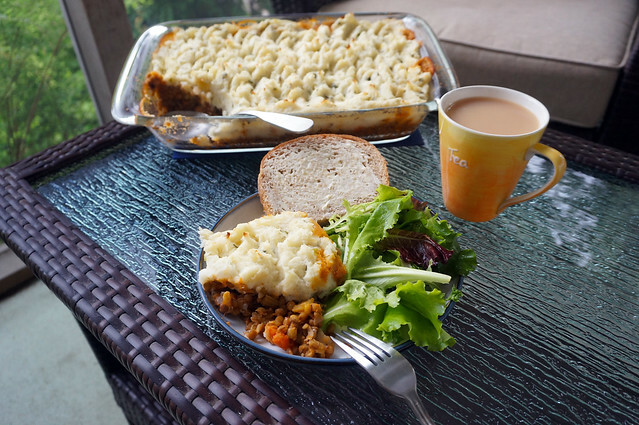 So apparently the collective unconscious has granted shepherd’s pie springtime status. And you know what? I’m okay with that. I’ll take any excuse to eat copious amounts of mashed potatoes. I should acknowledge, I suppose, that this isn’t a “shepherd’s pie” as such because the meat of the sheep — mutton or lamb — isn’t here at all. (There’s your etymology reminder for the day.) 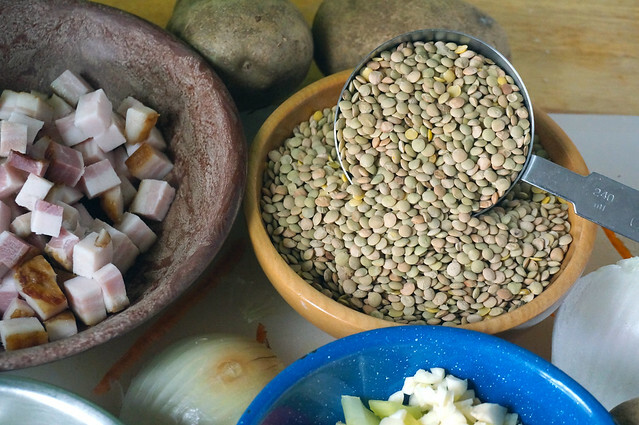 Instead, the bulk of the filling comes from regular old brown lentils. I’m sure the Shepherd’s Pie Lobby will come after me for this one, but: I don’t miss the lamb. 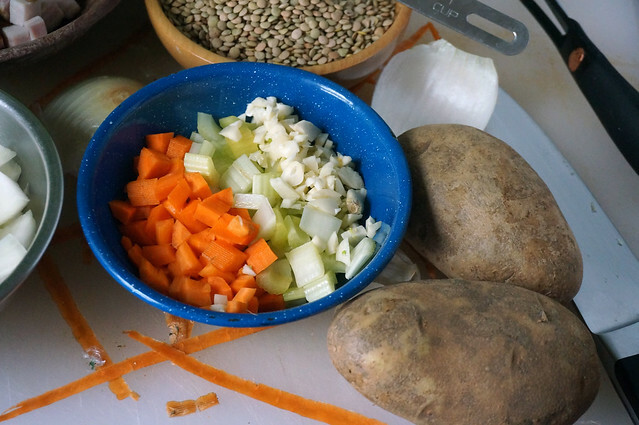 I love a classic shepherd’s pie, but the lentils here are just so lovely and toothsome, sweetened by the carrot and enriched by the onion and bacon. I do hope the weather warms up, I really do. But until it does, I’m terribly happy to be able to come home to a pan of piping hot shepherd’s pie, a rich stew of earthy lentils and smoky bacon topped with rich, creamy mashed potatoes to warm me to my core. And who am I kidding? Even if it shot up to 90 degrees tomorrow, I’d still polish off the pan with an ice-cold beer and my feet kicked up on the porch. Whether pleasantly warm or annoyingly cool, happy springtime. 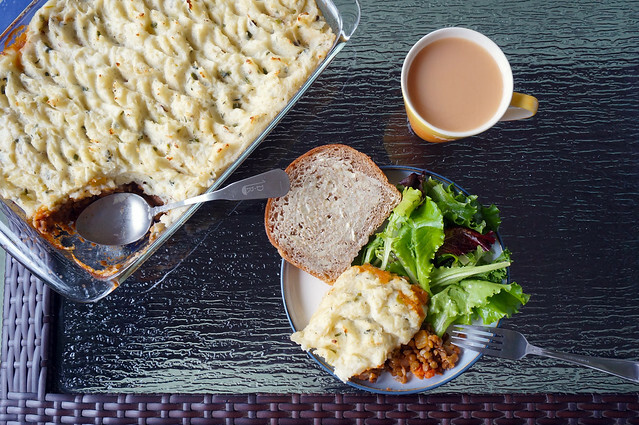 This riff on a classic shepherd’s pie — subbing in lentils for the minced lamb — was a happy accident when I forgot I had to bring a potluck dish to an event. I should probably be more conflicted that we’ve eaten two 3-quart pans of it in three weeks, but honestly? I wish I’d gone for three. In a large saucepan over medium heat, cook the bacon with a bit of water (which helps render it), stirring occasionally. Once bacon has begun to crisp (probably a good 10 minutes), remove all but 1 Tbsp or so of the fat. Return to medium-high heat and add the onion, cooking until the onion has softened somewhat and begun to turn translucent, about 3 minutes. Add the carrot, celery, and garlic and cook for another 3 minutes or so. Once the lentils are tender, add the tomato paste and cook briefly to combine. Remove the bay leaf before continuing. 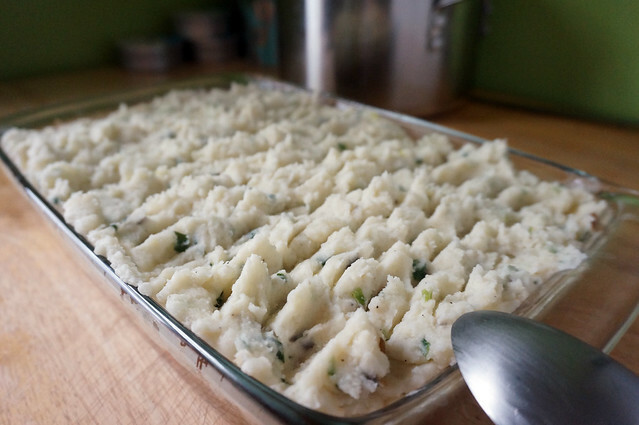 While the lentils are cooking, prepare the mashed potato topping. Peel the potatoes and cut them into 1 inch slices. Combine with 1 Tbsp kosher salt in a large pot and cover with cold water. Bring to a boil over high heat and cook until a thin knife meets almost no resistance, 7-10 minutes after the pot reaches the boil. Drain the potatoes in a colander. In their pot, over medium heat, melt the butter. 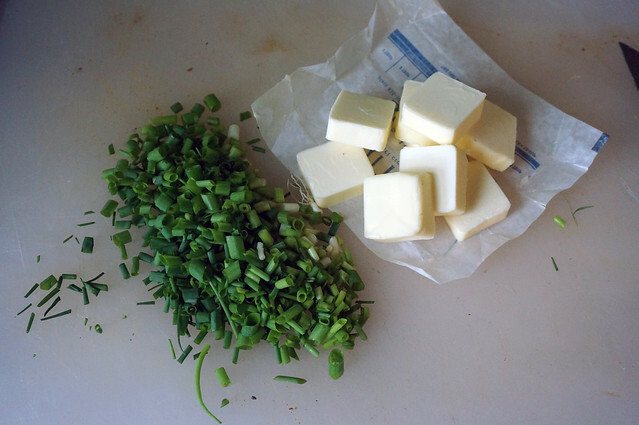 Once the butter has foamed, add the scallions and cook gently for about about a minute. Remove the pot from heat and add back the drained potatoes. Mash them most of the way, then add the buttermilk and salt and pepper to taste. Keep mashing until smooth. If the lentils aren’t yet done, cover the pot to keep the potatoes warm while the lentils finish. Spread the lentils evenly over the bottom of a 3 qt baking dish (e.g. a 9″ x 13″ dish). Bake for 25 minutes, until the potatoes have just slightly browned. Serve hot. The butter and buttermilk make the potatoes very rich in flavor already, so they doesn’t need cheese, per se. But when has that ever stopped anyone? A good cup of a grated, sharp white cheddar would be divine, as would a buttery young gouda. Stir the cheese in after you’ve mashed the potatoes to your liking. I first made this not with scallions, but with ramps (wild onions, one of the very first spring vegetables). If you can get ramps, they’re scrumptious here: slice the bulbs thinly and chop the stems and leaves, then proceed with the butter cooking just as you would with scallions. There’s no particular reason this shouldn’t work without the bacon, though I haven’t actually tried it. I would use a hearty vegetable stock to cook the lentils instead of water, as well as a good wallop of smoked paprika and/or a pinch of chipotle powder.